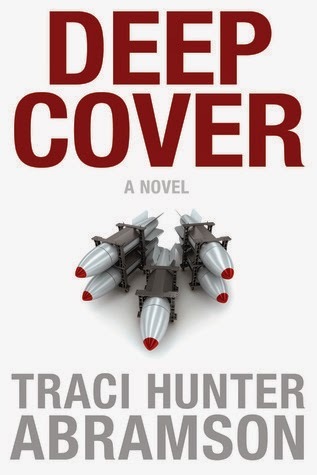 Deep Cover is the first of the Mystery/Suspense 2013 Whitney Award finalists I've had a chance to read and it started off the category with a bang! Kelsey has been deep undercover for two years in the Middle East as a nanny and tutor for the daughters of a suspected terrorist. After being shot in the leg for simply being in the wrong place at the wrong time, she is evacuated to the United States, her cover story still intact. Back at her parents' home, vacant while they serve a six-month mission, she tries to focus on recovering and settling back in to "normal" life, but the CIA still needs her expertise to prevent a terrorist attack on US soil. Kelsey's parents asked their neighbor and "adopted" son, the single 29-year-old FBI agent Noah, to keep an eye on the house while they were away. Unknown to both Kelsey and Noah, Noah is working to prevent the same terrorist attack as Kelsey. As they get to know each other, romance starts to blossom until their personal lives and professional lives collide. I was fascinated by Kelsey's seamless switching between her aliases: her real life as Kelsey Weber, her CIA desk job as Kelly Park, and as the tutor Taja Al-Kazaz. She speaks fluent Arabic and Hebrew, as well as a smattering of Pashtu and other languages. She's strong, capable, and confident at her job, both undercover and on desk duty as an analyst. Her sense of patriotism drives her focus on her work, though she regrets missing out on many family events and holidays, and not being able to be completely honest with them about her absences. While the relationship between Noah and Kelsey seems to move really quickly, it was also believable for me as they spend more time together and their friendship grows. The only part that felt less convincing was his reaction when he discovers her CIA cover identity. Especially since he works in the field, I would expect him to be more understanding from the get-go, though I'm sure surprise and shock, as well as concern for her family being kept in the dark would be the author's explanation. I have to admit I was less than thrilled with the recurring comments about how "she would gladly trade her world travels for the chance to live inside that beautifully simple life" of staying home and raising a family. It was very obvious that Abramson was setting them up to have "a traditional life of the husband bringing home the bacon," though I appreciate that she has Noah express that "he was willing to accept whatever choice she made." I can totally understand how after two years deep undercover in an extremely stressful and dangerous situation, she would yearn for a more peaceful life, but I couldn't help but wonder if right in the aftermath of so much upheaval was the right time to make that decision.